Manage your partys easily using the ingame chat. 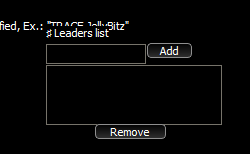 The Leader(s) is the character that write chat commands. If you character have Leader(s) into the leader list, this will follow his orders. CHAT #Type #Message : Send any message type, Ex. : CHAT All Hi! or CHAT Private JellyBitz Hi! FOLLOW #Player? #Distance? : Trace a party player using distance. UPPERCASE is required to use the command, all his data is separated by spaces. Included command inject to inject packet through script. All his data is separated by comma, encrypted will be false if it’s not specified. Let me to know if something is not working as expected, it’s a reworked plugin mostly. [18:28:14] Plugin: xControl.py has failed to load. I’ve downloaded Plugins v2.0, which contains python34 and I’ve just placed the plugin in “Plugins” folder. Identation error maybe. Try to download again and let me to know your results! It’s the plugin. I checked carefully this time, fixing a lot of mistakes. It’s loading the plugin now. But adding a leader to the list is not working. And it’s also on top of some text. It’s on top of TRACE command example: “TRACE JellyBitz”. It’s not looking so important at the moment. I am in-game, and when i put a name into the field and press “Add” nothing happens. The xControl folder inside your phBot config path is created correctly? It’s working now after i restarted the phBot client. Return scroll it’s problably the random it’s not working. About Teleport, it’s the space between the name. I can fix that, thanks for feedback. I can’t execute the Attack command and I couldn’t run Skill record. Can you tell us how this works? This options. How I execute this? It is an old plugin. You are not using the same from this thread, I can’t do nothing for you. Upss I did not know. A special feature that we can atack the goal of the party president would be wonderful. The ‘RETURN’ command does not work!